Something I try to do (but really struggle at sometimes) is to restyle pieces in my closet for different seasons. Being in my mid-20's, it's no surprise that I don't have a huge budget, especially for new clothes. So I tend to re-wear my outfits, but try to style them in completely different ways! I wore this dress a couple of months ago and styled it for the workplace. 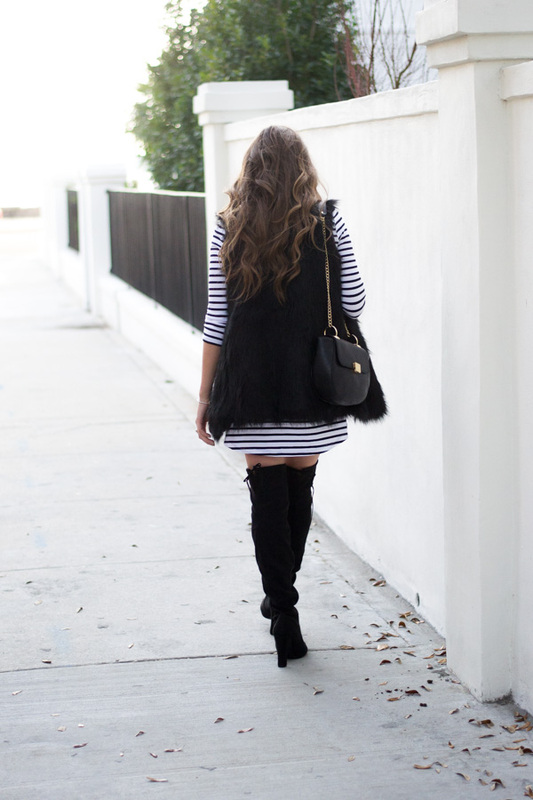 Today I am styling it as a chic winter stripes look, perfect for a date night, or a GNO! It's crazy how a pair of shoes can completely change the look on an outfit! I totally agree with wearing the same piece and styling them different ways! I love this look on you. Need that srtiped dress. Omg I agree! I'm like I can't wear that I've already worn it. But I'm not a celebrity I can't afford to buy new clothes every week lol. You look super cute babe! I love restyling pieces from my closet in a different way. It makes dressing so much more fun. Btw I love the dress and over the knee boots together! I sometimes struggle with re-styling things (especially on the blog) but I do it all.the.time in real life! Love how you styled this! This outfit is so perfect for winter! I love the vest and boots combo - so chic! The dress with the fur! Yes! What a cute dress! I love your hair! Love these stripes on you!! That vest and those boots are perfection!! 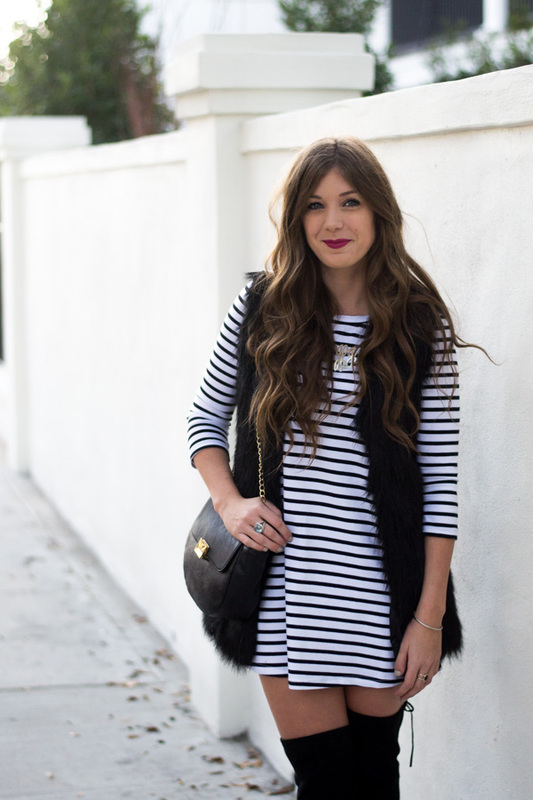 I love how you styled this striped dress! So chic! I am all about stripes at the moment too! Love those boots! You are so gorgeous, Kelsey! B+W combo is my favorite. And I think I need those boots in my life! I love that you are finding ways to restyle pieces you already have. I try to do that too, and can really surprise myself sometimes! I LOVE that dress... It's so classic and the 3/4 length sleeves are my fave. I LOVE your outfit! Restyling pieces is key to making the most out of your wardrobe, and when you have such amazing pieces like you photographed, it's easy to do! I also love your lip color, what are you wearing? I love how you pulled this outfit together. It's so gorg on you! i love stripes!! this outfit is seriously so cute on you! This looks amazing on you! I love the fur vest and over the knee boots! They definitely scream winter and take a summer dress into winter style :) Love it! Ooh I love those boots -and I truly can never get enough stripes! I love these stripes! You can never go wrong! Love love love this! It's such a darling outfit and you look amazing! Love the black and white stripes. You can't go wrong with this outfit! That dress is so cute paired with that vest! And those boots OMG! What a gorgeous dress! Love the tall boots, works perfectly! I love that dress worn with those boots! How adorable! This look is right up my alley! I need to get better about re-styling, if I like it one way I tend to just wear it the same when I repeat!